The Canadian militia and Dalhousie. A Dalhousie soldier. Dalhousie's Stationary Hospital No. 7. Moving onto the Studley campus. The Law School revised. The 1917 explosion. Mrs. Eddy and Shirreff Hall. Carnegie, Rockefeller, and Christian Movement. Deaths of Eben Mackay and John Forrest. Changing Dalhousie traditions. "War in 1914 was still glorious. 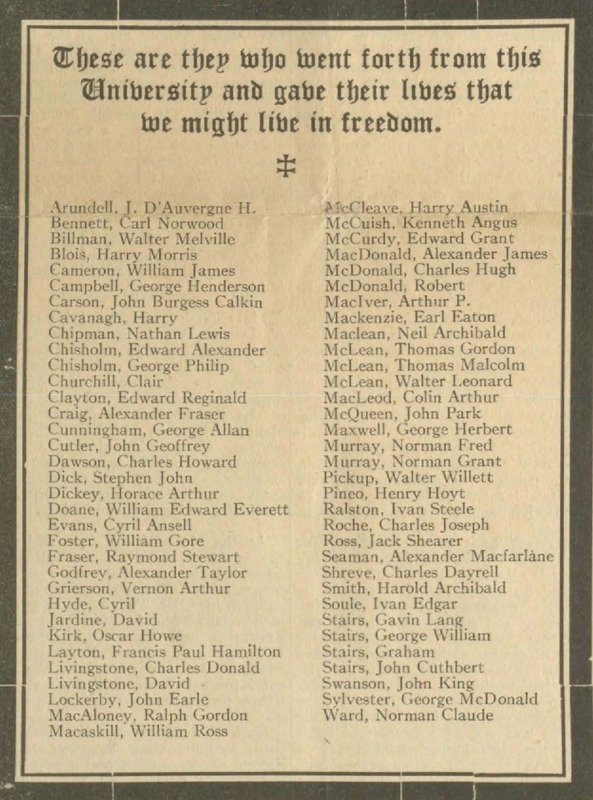 Haligonians remembered the sailing of Canadian contingents to South Africa just fifteen years before, and there was a bright flame of glory even about that war. There were few photographs of actual battlefield conditions; war was illustrated by splendid paintings that glorified the smoke, the fury, the wounding, and the dying. War was adventure; there were risks, as in all adventure, but risks were good for the maturing of young men. They toughened moral fibre, gave men the grit that society, increasingly civilized, was failing to give. Men, and women, needed some stress. Women got it naturally from child-bearing; men got it from fisticuffs and fighting - and war. "Hughes knew full well the art of managing newspapermen, having been one. He was able to establish the impression of himself as a dynamic man, with superabundant energy applied to original ideas. He succeeded in doubling the militia budget, and in 1912 and 1913 began building drill halls and local armouries. By 1914 some fifty had been established across Canada. (Halifax’s had been erected in 1899 at the time of the Boer War.) Dalhousie was looking for a combined drill hall and gymnasium before the 1914 war; Hughes had promised President MacKenzie as much. But he was hard to pin down, and his military estimates were by the spring of 1914 meeting more resistance from his colleagues. "The last major war, the Russo-Japanese War of 1904-5, was effectively over in fifteen months, and there was uncertainty, not to say unease, that the War of 1914 might be over before young Canadians could have a fair crack at it. One French general assured the press that the war would not be over until 1917 and that the British need not refrain from joining up because of the mistaken belief that it would soon end. "The war had overwhelming popular support in English Canada and propaganda about bleeding Belgium and the demon Hun augmented it, and soon compromised civilized behaviour. Concerts began to avoid including works by Beethoven, Brahms, and especially Wagner. German teaching dried up. Berlin, Ontario, an essentially German-speaking community, decided to change its name to Kitchener..."